Our mission was to identify insect collectors and breeders and convince them to test new insects for rearing and processing for consumption with us. When we arrived in Central Myanmar we learned quickly that insect-eating here was all about one insect that everyone loved: the GIANT cricket. We found the insect indeed to be a giant having a body larger than a man’s thumb. Young and old people of all ethnic groups in Myanmar enjoyed eating it – either fried as a snack sold at the road side or at home with some liquor or beer. We also learned that insects are not “food for the poor” because market prices of insects are higher than those of meat or fish. The giant crickets are long-distance travelers being carried across the country. Usually they are stored in ice and put in large insulated plastic boxes until they reach their final destination which are Mandalay, Yangon or other cities in the country. We also learned that people only like to eat the whole insect. The idea of eating insects as powder was as strange as the idea that insects could be farmed for livelihoods. We quickly learned that in Central Myanmar people eat “crickets, not insects”. Especially many ethnic Barmar (Burmese) would not touch any other insects but leave them for consumption to other ethnic groups that are part of Myanmar’s famous rich ethnic diversity such as Chinese, Shan, Pao, and others. 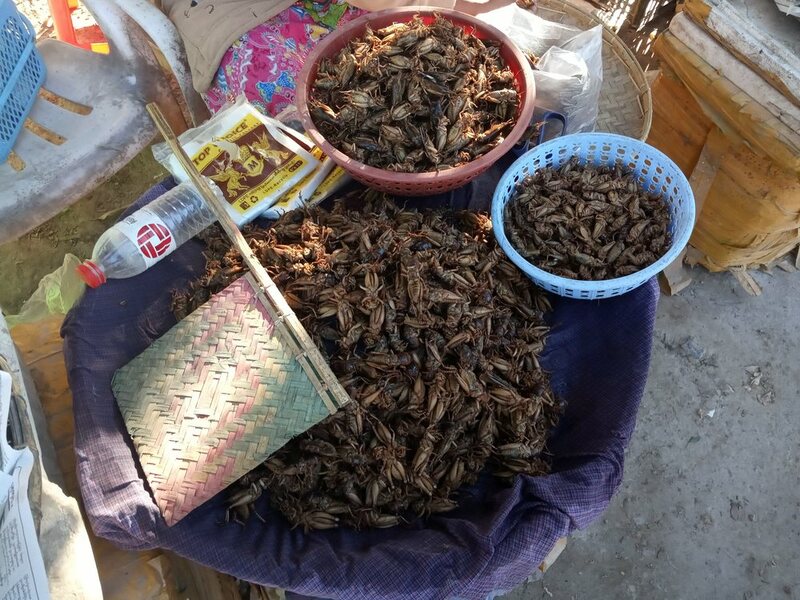 We quickly realized too that in Myanmar not though everybody was munching on the yummy insects that were available in the market during the season, no one ever could imagine that insect rearing would be possible, viable and attractive or even necessary. The only reared insect that we found during our trip in Myanmar was the silk worm. We were warmly welcomed by the government’s silkworm egg production and mulberry research farm in the city of Pyin Oo Lwin. There we could see large green mulberry plantations for feed, comfortably warm-breeding rooms full of caterpillars and some laboratories too. 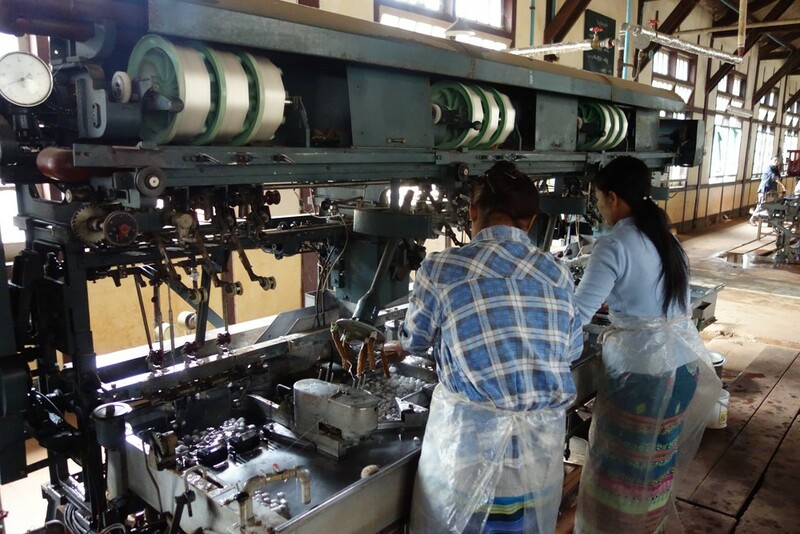 We were also invited to the silk factories, where cocoons were reeled producing silkworm pupae as an edible byproduct, which is appreciated by many people in the region. To our disappointment the silk worms were only consumed by the laborers and their families, whereas most of the yummy worms (the whole cocoons) are exported to China. There, they are extracted with the help of modern facilities. Some of them are then re-imported to the markets of Myanmar. 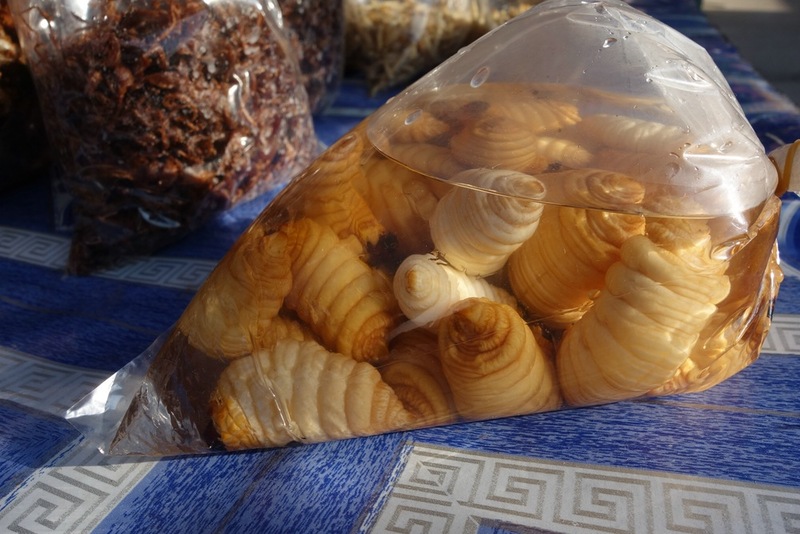 Cocoons are reeled producing silkworm pupae as an edible byproduct. Photo: Sarah Nischalke. 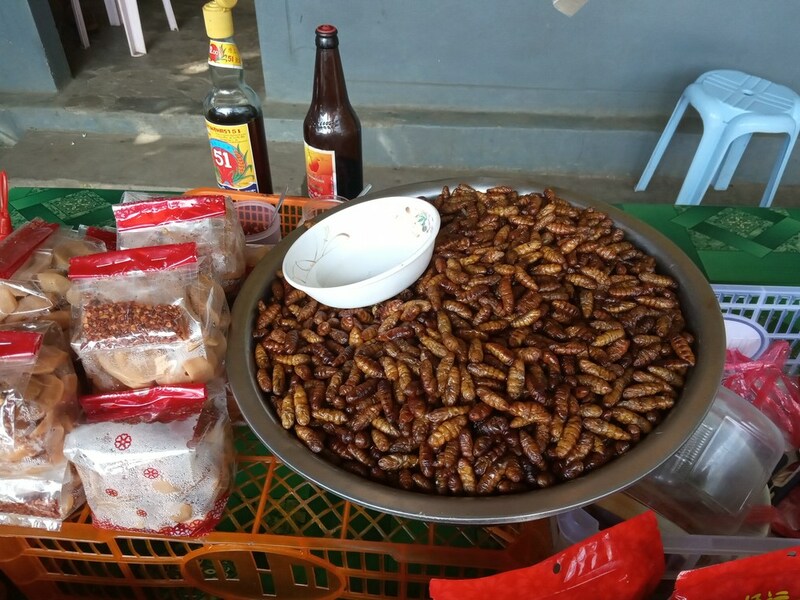 Again and again, we got the same feedback: If we wanted to be successful with our mission, we should visit Shan State, the paradise for insect-lovers and entomophagy, how the culture of eating insects is called. Shan State is the largest State in the country with mountainous terrain, an extremely high ethnic diversity and bordering Thailand and China. We were surprised that people who happily collect insects or set up traps were quite reluctant in getting involved in rearing them. They explained to us that especially for Buddhists, who use to happily eat meat and insects, killing them would affect their karma in a bad way. So the idea of a giant insect slaughter house was quite appalling to our interviewees. As everyone pointed at Shan State we decided to start exploring the insect paradise in its capital Taunggyi, which is pleasantly located on an altitude of 1,300 m in the mountains. Once we arrived we learned that many different insects were consumed in this region, however not during this season. We visited the famous market No. 5 where we found preserved insects. This was quite interesting to us because our project focuses on processing. On the market, we found friendly ladies selling plastic jars with fried giant hornet and wasp nymphs for giant prices. We also discovered yummy bamboo borers, a costly delicacy and cicadas, especially loved by children. The most advanced packaging technique that we discovered was developed by a lady who wanted to send the delicious bamboo borers to her nephew in Europe. She was actually selling vacuum-packed meat products and just decided that bamboo-borers could vacuum packed too. However, in Taunggyi we did not succeed in promoting our idea of insect rearing either.